SF Social is the perfect way for your office to build lasting friendships. Our corporate events are designed to improve teamwork, relieve stress from work, and help your group feel the joy of play together. 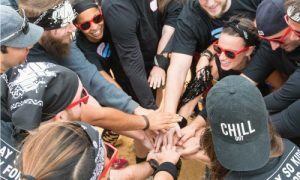 Whether you want a day of active team-building, a private party with games, or a field day on your company’s campus, we can do it all. Please complete the Event Inquiry form below and our events coordinator will be in touch within 24 hours. Best number to reach you with updates on your event. Are you/your company a Volo Member? Please select all that work for you. We are flexible on time. Please select all that apply. Hold Cmd + to click multiple options. Please note there is a 2-week turnaround time. Is there anything else you would like to add to this event? Do you have any other comments/questions/budget restrictions regarding your event? Don’t see what you need? Contact us at corporate@volocity.org and we’ll make it happen for you.